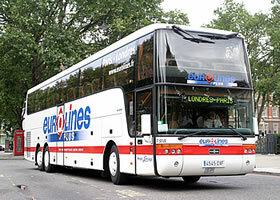 This page explains how to travel by coach (long-distance bus) in the UK. Coach travel is usually cheaper than going by train, but journey times are longer (up to twice as long). To plan journeys, buy tickets, and to check for any travel disruption, visit the website of the company operating the service (see below). 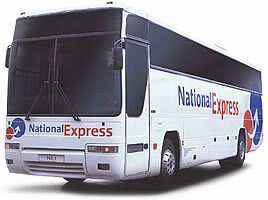 For detailed instructions about how to book coach travel with National Express (the company which operates the largest coach network in the UK), see: Shop/Company/NationalExpress. This page also explains about the Young Person's Coachcard (the discount coachcard for full-time students or young people aged 16-26). 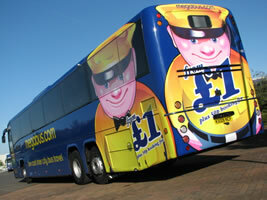 Fares start from £1 + 50 pence booking fee. (booking fee is per booking not per ticket). Ticket prices rise as the date of travel gets nearer and booking numbers increase. Tickets can be booked up to 6 weeks in advance. In London most journeys leave from Victoria Coach station, which is a fully equipped station with seating areas, a mobility assistance lounge, refreshments, toilets, retail outlets and electronic information screens. All coaches have capacity for passengers to store one piece of luggage and one holdall. All coaches have toilets and we have a number of wheelchair accessible coaches in the fleet (please note wheelchair bookings must be made over the phone with at least 24 hours notice see website for further details). Students at UK universities are able to get a discount by booking online and inputting their NUS card number in the relevant field. The on-line booking system means booking is ticket-less and you will receive and e mail with your booking number or a text message if you leave your mobile phone number (texts cost 10p). With a mobile number you will also receive a text if your coach is delayed and running late. 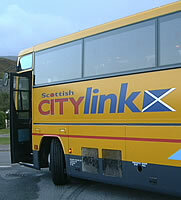 Scottish Citylink provides a large range of coach services between towns in Scotland. Their website is at: http://www.citylink.co.uk. If you are a full-time student you can get a Student Discount Card (which lasts one academic year). If you are aged 16-25, you can buy a Citylink Young Persons Smartcard. These cards will allow you to save up to 20% on many adult fares across the Citylink network and on National Express journeys within Scotland. Ulsterbus provides most of the coach services in Northern Ireland. Their website is at: http://www.ulsterbus.co.uk. If you are a full-time student you can get a Translink Student Discount Card. These cards will give discounts on rail and coach services in Northern Ireland. It is easy to get confused between Victoria Coach Station, Victoria Bus Station and the Green Line Coach Station - they are all in different locations (shown on the simple map below; for a more detailed map click here). Victoria Coach Station is on Buckingham Palace Road: it takes 5-10 minutes to walk there from Victoria train station, underground station or bus station. This is where you go for coach services departing from London - arrivals go to a different location which is a short walk from here. Victoria Bus Station is where many of the local London bus services arrive and depart, and is directly outside the main exits of the train and Tube stations. 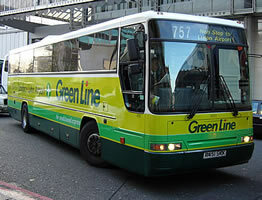 Green Line Coach Station is in Bulleid Way and is the departure point for most Green Line services: there is a pedestrian passage leading to it from Buckingham Palace Road (it is also possible to get there from Eccleston Bridge). Note that there are two frequent coach services to Oxford: the Oxford Espress leaves from Victoria Coach Station, but the Oxford Tube leaves from Grosvenor Gardens (the first stop is at stop 10 on Buckingham Palace Road). 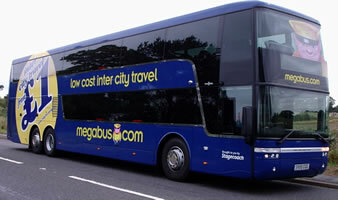 - By internet from a provider such as National Express (see details above). You can print e-tickets, or have paper tickets sent to you. - Telephone: Call the Telephone Sales Office (020) 7730 3499 between 9am and 7pm Monday to Saturday, at least 1 hour before your departure. You can pay by debit card or credit card. This will save you time queuing. - By going to the ticket office. Note that there may be long queues at busy times, such as during public holiday weekends. In general, arrive at least an hour before your departure time, unless coaches to your destination are frequent. Make sure that you join right queue. For UK destinations, go to the main ticket hall. There is a long queue for the counters for buying tickets, and a separate queue on the side to collect tickets for telephone reservations. If you are travelling to Ireland or continental Europe using Eurolines (or another similar company), there is a check-in desk behind Gate 19; again, make sure you join the correct queue for your destination (this is shown on boards above each check-in desk). Services in the departures terminal include left luggage, toilets (not open early in the morning), telephones and internet access. Travelling to Europe by coach can be the cheapest option, although journey times are much longer than for train or air travel.